Fibroblast contraction occurs on release of tension in attached collagen latticesDependency on an organized actin cytoskeleton and serum. compaction of the stress fibers with their subsequent disappearance from the cell. Tissue contraction is a part of normal wound healing. (Abercrombie et al., 1960; Higton and James, 1964). The generation of tension is believed to be a cell-mediated event; however, how cells generate the forces resulting in tension during tissue contraction is unclear. Fibroblasts have the potential to generate tension. Tomasek, 1990; Ehrlich and Rajaratnam, 1990). One method to study the development and mainteReceived July 15, 1991; accepted September 13, 1991. Structural Biology, Albert Einstein School of Medicine, Bronx, NY. preliminary account of part of this report has been previously presented (Tomasek et al., 1989). collagen lattice a t each time point by the initial diameter of the lattice. (Polysciences, Warrington, PA) (Tomasek et al., 1982). 100 C transmission electron microscope. cultured in complete media containing M-199 media with a n Olympus Vanox photomicroscope. and cultured in 75 cm2 tissue culture flasks (Falcon). conjugated to 5 nm colloidal gold (Janssen Life SciFibroblasts used in these experiments were between ences Products, Piscataway, NJ) diluted 1:5 in PBS. cell passages two and ten. the collagen lattice. Care was taken not to detach the Albany, NY). collagen solution so that a final cell concentration of attached collagen lattices after 5 days in culture. 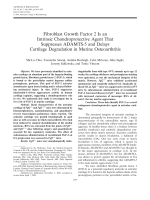 Lat0.625, 1.25, or 2.5 x lo5 cells/ml was obtained. by freeing the edges of the collagen lattice with a scal- for a final concentration of 6 kM. Control lattices repel and releasing the rest of the area by gently pipet- ceived a n equivalent concentration of DMSO (0.3%). Fig. 1. Dark field photomicrographs illustrating rapid contraction. rounded. c: Ten minutes after release the collagen is more compacted. Epoxy sections (1 km) were cut perpendicular to the underlying substratum and stained with toluidine blue. Bar, 20 pm. bovine serum 30 minutes after release. The rate of lattice contraction was determined as described above. Figure 1 illustrates the rapid contraction that occurred upon release of an attached collagen lattice. within the first 10 minutes after release (Fig. 2a,b). extending from the cell surface. The collagen fibrils become compacted after release. Bar, 10 km. concentration increased the amount of rapid contraction (Fig. 2a). release, was further analyzed. Figure 2b shows measurements of the lattice diameter during this time. the rapid retraction that occurs within 10 minutes after release occurs within the first 2 minutes. as compared to cells in attached collagen lattices (Figs. 3b, 4b). The surface had developed numerous protrusions and nuclear indentations were prominent (Figs. the fibroblasts appeared more rounded and the collagen fibers more compacted (Fig. 3c). found to contain abundant bundles of actin microfilaments oriented parallel to the long axis of the cell (Fig. labelled intensely with anti-fibronectin antibody (Fig. the previously described fibronexus (Singer, 1979). staining for actin organized into aggregates (Fig. 5c). by densely packed microfilaments (not illustrated). cytochalasin D-treated lattices (Fig. 8b). fibers appeared thickened and intensely stained 2 minutes after release (b, arrows). Bar, 25 pm. and by 10 minutes had almost totally disappeared (Fig. immediately prior to release resulted in rapid contraction comparable to that observed for the control (Fig. occurred immediately upon the addition of serum (Fig. amount of rapid contraction back to control levels. particles are primarily restricted to extracellular filaments that extend from the cell surface. a: Bar, 0.5 km; b Bar, 0.5 km. underlying substratum undergo a rapid contraction. process dependent upon a n organized cytoskeleton. Farsi and Aubin, 1984; Unemori and Werb, 1986; Mochitate et al., 1991). Rapid collagen lattice contraction appears to be primarily dependent upon active fibroblast contraction. D, just prior to release, inhibited rapid contraction. Active fibroblast contraction would depend on a n organized actin cytoskeleton to generate contractile forces. contraction of the collagen lattice. serum on collagen lattice contraction was immediate. by which serum promotes rapid contraction is currently under investigation. adjacent to that seen in Figure 7a. Prominent periodic electron densities are present within bundles of actin microfilaments. Intermediate filaments are closely associated with bundles of actin microfilaments (arrowhead). a: bar, 2 Km; b: bar, 0.5 pm. (arrow). The lattices immediately contracted upon addition of serum. cytochalasin D (A) or 0.3%DMSO ( 0 )for 30 minutes prior to release. in tension and stress fiber formation. after release appear highly condensed and have prominent periodic electron densities along their length. contraction of the stress fibers (Langanger et al., 1986). stress fibers (Tomasek, unpublished observations). contraction of a released collagen lattice. fibroblasts have the ability to modulate into myofibroblasts in contracting tissues under the appropriate conditions. tissue. It does not develop, however, to the extent observed in splinted wounds (Abercrombie et al., 1960). stress fibers, which in turn are highly contractile. Health Sciences Center (PHF#101 and PHF#85). Abercrombie, M., D.W. James, and J.F. 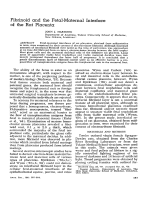 Newcombe 1960 Wound contraction in rabbit skin, studied by splinting the wound margins. in the skin of rats. J . Embryo]. Exp. Morphol., 2:264-274.
phallacidin. Proc. Natl. Acad. Sci. of different proliferative potential in vitro. Proc. Natl. Acad. Sci. and exogenous collagen fibers in collagen gels in vitro. J. Cell. skin. J . Anat., 89:114-123. 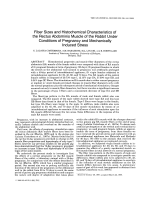 Burridge, K. 1981 Are stress fibers contractile? Nature 294r691-692. fibers in vitro and in situ: A review. In: Cell and Muscle Motility. J.W. Shaw, ed. Plenum Press, New York, Vol. 5, pp. 83-132.
fibroblast movement. J. Cell Biol., 90.187-200. Platelet isoforms of platelet-derived growth factor stimulates fibroblasts to contract collagen matrices. J. Clin. Invest., 84.10361040.
are stimulated by microtubule inhibitors. J. Cell Sci., 93t255266. in vitro model of wound contraction. Tissue Cell, 22.407-417.
during fibroblast-induced contraction of three-dimensional hydrated collagen gels. Cell Motil., 4:29-40.
and function. J . Exp. Med., 135r719-734. 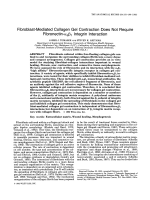 Guidry, C., and F. Grinnell 1985 Studies on the mechanism of hydrated collagen gel reorganization by human skin fibroblasts. J .
mechanism for collagen morphogenesis. Nature, 290r249-251. A new wrinkle in the study of cell locomotion. Science, 208.177179. Higtan, D.I.R., and D.W. James 1964 The force of contraction of fullthickness wounds of rabbit skin. Br. J. Surg., 51:462-466. Isenberg G., P.C. Rathke, N. Hulsmann, W.W. Franke, and K.E. 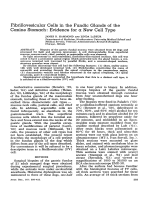 Wohlfarth-Botterman 1976 Cytoplasmic actomyosin fibrils in tissue culture cells. Cell Tissue Res., 166t427-443. 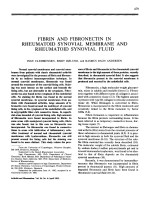 Kreis, T.E., and W. Birchmeier 1980 Stress fiber sarcomeres of fibroblasts are contractile. Cell, 22.555-561.
in stress fibers of cultured cells. J . Cell Biol., 102:200-209.
and protein synthesis. Exp. Cell. Res., 193:198-207.
stimulates collagen-matrix contraction by fibroblasts: Implications for wound healing. Proc. Natl. Acad. Sci. USA, 85.48944897.
responsiveness. Exp. Cell Res., 182.572-582.
and biosynthetic activity. J . Invest. Dermatol., 93r792-798. nections. In: Dupuytren’s Disease. R.M. McFarlane, D.A. McGrouther, and M.H. Flint, eds. Churchill Livingstone, Edinburgh, pp. 86-98.
and human fibroblasts. Cell, 16:675-685.
co-distribution of fibronectin and actin fibers in granulation tissue: Immunofluorescence and electron microscope studies of fibronexus at the myofibroblast surface. J. 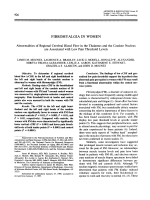 Cell Biol., 98:20912106.
relationship to wound contraction and fibrocontractive diseases. In: Molecular and Cellular Biology of Wound Repair. R.A.F. Clark, and P.M. Henson, eds. Plenum Press, New York, pp. 373402.
actin microfilaments are organized into a fibronexus in Dupuytren’s diseased tissue. Ana. Rec., 230:175-182.
of collagen lattices by myofibroblasts is dependent upon organized actin microfilaments. J . Cell Biol., 107t602a. fibroblasts: Distribution of actin, a-actinin, and myosin. Dev. The cytoskeleton and extracellular matrix of the Dupuytren’s disease “myofibroblast”: An immunofluorescence study of a nonmuscle cell type. J. Hand Surg., 11:365-371.
contractile fibroblast (myofibroblast) in Dupuytren’s disease. J .
Unemori, E.N., and Z. Werb 1986 Reorganization of polymerized actin: A possible trigger for induction of procollagenase in fibroblasts cultured in and on collagen gels. J. Cell Biol., 103;10211031.
tension force generation. Cell Tissue Res., 165:327-344.